From Bratwurst in Bavaria to Kubasa in Kiev, many cultures have some version of what Americans have, with winning brio, called the hotdog: a convenient and tasty arrangement of processed meat held in a bun designed specifically for the job and topped with dressing, making for a macronutritiously balanced package that carries well in one hand. Not so in Switzerland. Why? 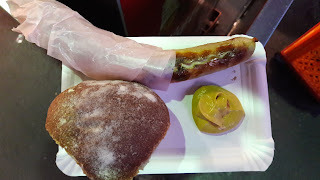 On a visit to Switzerland, the ambulatory omnivore is confused to discover that ordering a cervelat - sometimes referred to as The National Meat - yields a perplexing plate on which a dollop of mustard stands lonely next to a crusty roll of bread and a sausage partly wrapped in wax paper. This makes eating a complex operation requiring two hands, careful attention to tripping hazards, and a tenuous calculus to ensure that the bread, meat and topping are depleted at roughly equal rates. This state of affairs seems altogether out of sorts for a country well known for its efficiency. Why make it so much extra work to eat a simple cylinder of spam on the go, when so many other better examples exist? Here already the alimentary anthropologist has discovered the key. The justification for the sausage-in-bun arrangement so common in other countries (ie., that it is a labour-saving adaptation) is moot - and even possibly bad - in Switzerland. Among the Swiss the goal, we should remember, is almost never to work less. The labour-intensive Swiss version of the hotdog, therefore, is already perfect: it contains all the required elements, and a hefty bit of Calvinist sweetener. So it is that the crucial addition to every Swiss sausage is not only mustard, but hard work.